Nick West passed away yesterday after fighting cancer for about two years now. Nick was a major influence on me when I was a student at ITP, and a good friend, so I want to write down some of my impressions of him, in hopes that I’ll be able to carry on what I admire about him. Nick was the principal investigator on the Yorb interactive television project at ITP when I met him. The project had been started some years earlier by Dan O’Sullivan, and Nick was running the project and teaching the Yorb class when I came to ITP as a student. The class didn’t always produce successful TV moments. Nick was as enthusiastic about the disasters as he was about the successes, though.Â More than anyone I’ve ever met, Nick could embrace failure and pull something positive out of it. We talk about this a lot at ITP; Nick showed me how to do it gleefully. In my second year as a student, I worked as Nick’s research assistant. We were given a mandate to come up with a new research agenda, and to leave interactive TV behind. We experimented with location-based media, tying a GPS receiver to a series of Quicktime VR panoramas mapped to the map of Greenwich Village. In order to demonstrate it, we had to carry a laptop running Director, a handheld GPS receiver, and assorted equipment — it was no iPhone, for sure. The demos were a mess, but we learned a lot in making them.Â It was an incredibly valuable experience for me, getting to spend the whole year working with Nick.Â He wasÂ relentlessly curious about everything, so we tried out all kinds of chat systems, virtual environments, navigation systems, and other tools that I would never have explored on my own.Â He had a way of blending his interest in politics and cultural theory into what we were doing in an offhand way, so I’d get a larger perspective on the project without realizing it. What I remember most vividly about Nick is his constant enthusiasm for new subjects, his love for the absurd, and his relentlessly positive attitude. When presented with an obstacle, he did everything be could to see it in a positive light. Our last conversation is perhaps the best example. He was really excited about some of the new cancer treatments he was trying out, and he talked about them with the same geeky enthusiasm he had for everything else he got interested in. “I’m only going to talk about cancer for another 45 minutes, I promise,” he said.Â I told him that was fine, he managed to make it into a fascinating story.Â “It’d be a lot more fascinating if it weren’t also killing me, I gotta admit,” he said, then launched into a detailed technical explanation of the treatment. We spent the rest of the afternoon talking about a wide variety of subjects, making bad puns, and enjoying the sunshine.Â It was Nick at his best. 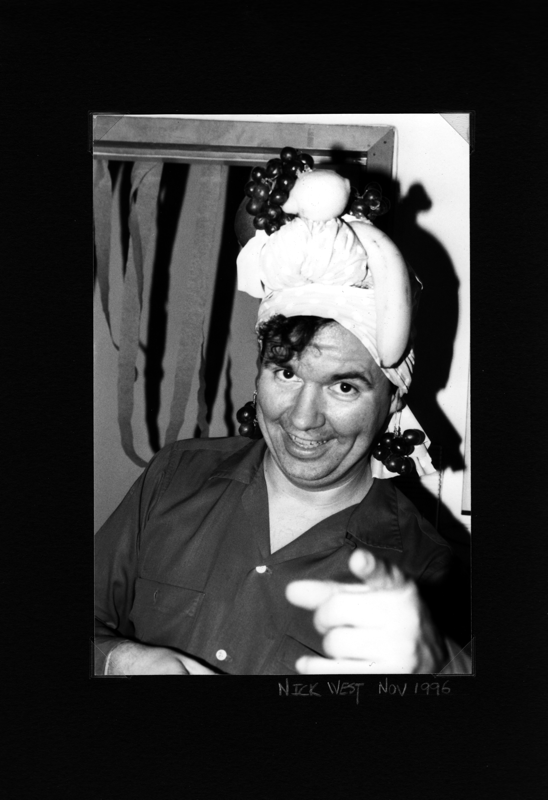 I don’t have a lot of pictures of him, unfortunately.Â This one is from November of ’96; not sure whose the Carmen Miranda hat is, probably Santiago Echeverry’s.Â I like this shot, though. It makes me smile, something he was good at.